Aunt Sally Good Food: The best garlic bread you'll ever eat!! Oh, you're going to love me for this one!! Do you roast garlic in the oven? Do you think it's ridiculous to heat an entire oven for one head of garlic? Well, Auntie has come to save the day. Simply poke a fork all around the garlic head. Then microwave at 50% power for about two minutes or until soft. Voila! Roasted garlic without the roasting. While you're at it, you might as well make the very best garlic spread you'll ever eat! 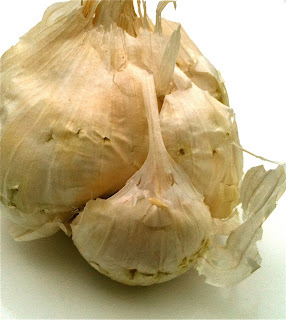 Poke garlic all around with fork. Microwave at 50% power for two minutes or until soft. Peel off skin and cut off tough root. Place cloves in bowl of food processor. Add salt, oil, and butter. Process until smooth. Slice bread horizontally. Spread with garlic spread. Top with Parmesan cheese and paprika to taste, if desired. Close bread together, wrap in foil. Bake at 350º until warm and toasty. Serve hot. You may omit foil, leave it open and place on baking sheet, if you prefer to have it toasted. Well, I'd heat the oven to roast ten heads of garlic. YUM! !